Article first published as Thin Mint Truffles on Blogcritics. As much as the cookies are delicious as is, they're just as much fun and delicious to play with in the kitchen. These truffles only require a bit of cream cheese and the cookies - that's it! Simply process the cookies down to crumbs and combine with softened cream cheese. Roll them into a bite-sized ball, chill and then devour. Not a fan of Thin Mint cookies? No worries! Try the recipe using your favorite cookie, Girl Scout ones or one from the store. Happy Truffling! In a food processor, process 1 sleeve of Thin Mints Girl Scout Cookies until they resemble course sand. Transfer the mixture to a large bowl and add the cream cheese. Mix together by hand until fully incorporated. 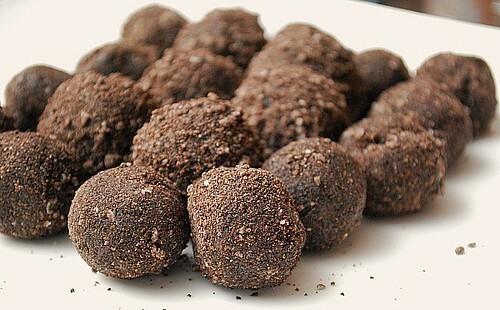 Scoop out by the tablespoon (or use a small scoop) and roll into a nice ball in your hands to form truffles. Pulse the extra 3 cookies in the food processor until it resembles course sand and place in a small bowl. Roll the truffles in the processed cookie crumbs to coat. Chill coated truffles for at least an hour to set up.... or overnight for flavors to really develop with the cream cheese. These look truly amazing. They are so pretty and I love that it involves only 2 ingredients. Wow, what a great idea! I LOVE thin mints! These sound wonderful! I loooove thin mints! Oh yum! Just cream cheese and Thin Mints? Those sound extremely indulgent and simple! I have to try these soon! These look so yummy and decadent! I always loved Thin Mints and these look even better!! Mmmmm...these sound WAY better than the Oreo version! Ahhhh..thanks girl for the shout out!!!!! Would you mind if my Girl Scout troop shares this recipe with buyers (with a credit to your site, of course)? Hi Kristy - of course, thank you!